Chairman of the Senate Committee on FCT, Senator Dino Melaye (APC, Kogi West) appeared at the Senate this morning wearing an academic gowon . 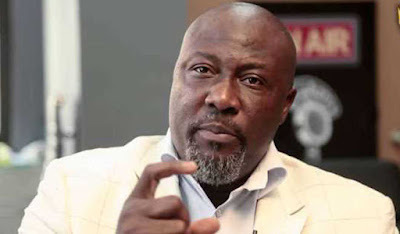 Melaye who has been in the news over an alleged possession of fake results from Ahmadu Bello University (ABU), Zaria arrived the Red Chamber around 10.30am. Our correspondent reports that the lawmaker moved from one seat to the other greeting his colleagues. The Vice Chancellor of ABU, Professor Ibrahim Garba had on Monday cleared Melaye, saying he graduated at the Institution with 3rd class division.